And he arose, and rebuked the wind, and said to the sea, Peace, be still. And the wind ceased, and there was a great calm. 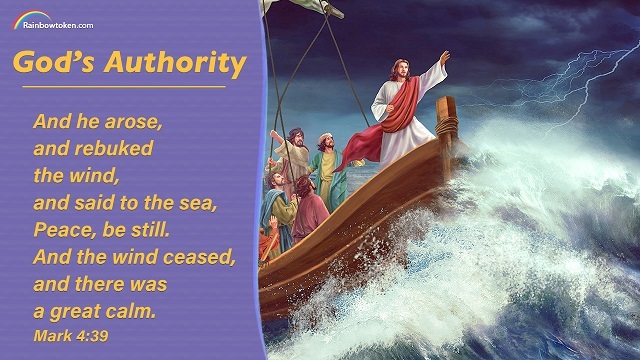 A furious storm came up on the lake when the Lord Jesus and His disciples were in the boat, but the words of Jesus calmed the wind and waves. After that, the disciples said to each other, “What manner of man is this, that even the wind and the sea obey him?” (Mark 4:41). They felt Jesus Christ was not an ordinary man, and His words were full of authority and power. No one has the ability to calm the wind and the waves, only God who created all things can do it. God says: “God created everything, and having created it, He has dominion over all things. In addition to having dominion over all things, He is in control of everything. What does this mean, the idea that ‘God is in control of everything’? How can it be explained? How does it apply to real life? How can you come to know God’s authority by understanding the fact that ‘God is in control of everything’? From the very phrase ‘God is in control of everything’ we should see that what God controls is not a portion of planets, a portion of creation, much less a portion of mankind, but everything: from the massive to the microscopic, from the visible to the invisible, from the stars in the universe to the living things on earth, as well as microorganisms that cannot be seen with the naked eye or beings that exist in other forms. This is the precise definition of the ‘everything’ that God is ‘in control of,’ and is the scope over which God wields His authority, the extent of His sovereignty and rule.” Regardless of whether we believe or not, God’s unique authority, which created and commands all things, and holds sovereignty over all things will not change. As long as we pay attention to the people and things around us, we will know more about God! The disciples of Jesus Christ were able to have some knowledge of God’s authority because of their experience. And I will make of you a great nation, and I will bless you, and make your name great; and you shall be a blessing: – Genesis 12:2 Thoughts on Today’s Verse… This is God’s promise to Abraham. God determined to achieve His’s will on the descendants of Abraham and..